The lady atop was injured quite badly when the top was toppled by catching overhead ropes at Irthlingtboro'. A Rushden Girl, an entrant in Irthlingboro’ Hospital Procession on Saturday, was injured in an incident which marred the Parade, and had to be moved to Northampton General Hospital, in aid of which the town was en fete. The young lady, Miss Ivy Lawman, of Park-avenue, Rushden, was the central figure in an impressive tableau called the Nurse Cavell Memorial tableau, which won first prize of £1 in its class in the parade. 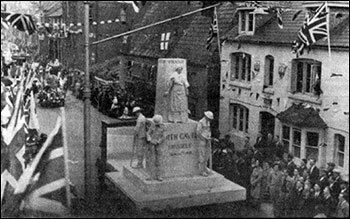 Entered by the Rushden Youth Group of the league of Nations Union, the tableau was mounted on a lorry. On a platform on the lorry stood four soldiers in uniforms of white, and Miss Lawman as Nurse Cavell stood erect against a white pillar in the centre of them. For the sake of steadiness as the lorry moved, there was a fastening between her and the pillar. As the procession wound its way round the corner of Hayway and Allen-road, the top of the pillar failed to clear some low-hanging electric cables stretching across the road and it crashed to the ground, carrying Miss Lawman with it. She sustained a fracture of the left leg, head abrasions, and suffered considerable shock. Members of the Irthlingborough Division of the St. John Ambulance Brigade were soon on the spot to render first-aid, and Dr. J. H. McGibbon attended her. Later she was taken to Northampton General Hospital in the Irthlingborough Ambulance. Lying on a stretcher outside Northampton General Hospital on Saturday afternoon was Miss Ivy Lawman, the Rushden girl who as “Nurse Cavell” was thrown from a carnival lorry at Irthlingborough on June 26, receiving extensive injury to her ankle. It was now Carnival Day at Northampton and the head of the big procession came to a halt opposite the hospital. One of the mounted tableau was the same Cavell memorial scene in which Miss Lawman had been the central figure—the entry of the Rushden L.N.U. Youth Group—and the famous nurse was now impersonated by another girl. While the procession waited, Miss Constance Bennett, representing the Youth Group and the tableau members handed a bouquet to the injured girl and gave her a message of good cheer. Nearby stood the giant “Showboat” entered by Messrs. John White Ltd., of Rushden. From it dismounted two of the “crew,” Mrs. R. Cox and Mr. S. Pratt, who walked forward with a bouquet for Miss Lawman, and fruit for the Matron to distribute among the patients. Miss Lawman has undergone a further operation during the week.